Istituto Svizzero is pleased to present “Martin Kippenberger. The Museum of Modern Art Syros” at Fondazione Sant’Elia, Palermo. Part of the official collateral programme of the biennial MANIFESTA 12, the exhibition, curated by Samuel Gross, will be accompanied by a symposium, screenings, and concerts open to the public (6-7-8 July). Martin Kippenberger (1953- 1997) was one of the most versatile and articulate artists during the post-war era. The artist, charismatic and energetic figure, produced large amounts of elaborated works with different mediums: paintings, sculptures, collages, posters, and large installations. Kippenberger approached his work with an irreverent and enthusiastic energy, reinventing constantly his artistic career, undermining art’s rigid categorisations of authenticity and originality through the use of appropriation, collaborations and commissions. The exhibition “Martin Kippenberger. 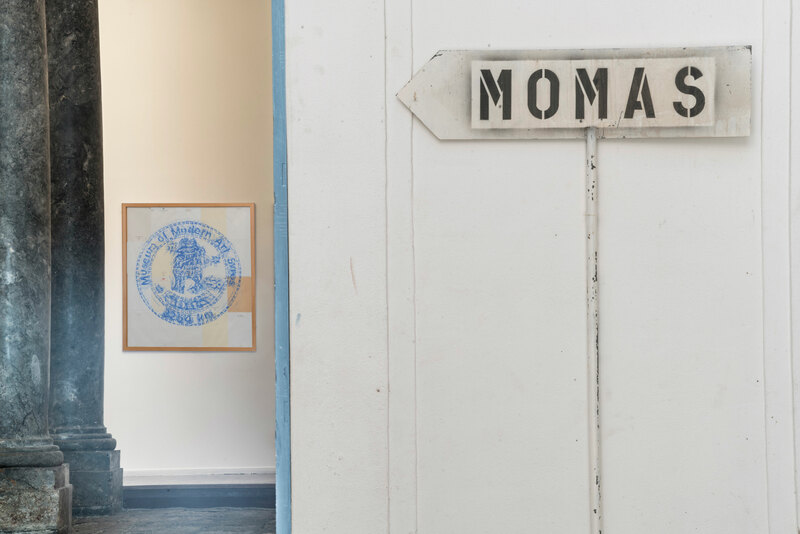 The Museum of Modern Art Syros” takes the artist’s last curated show at MAMCO of Geneva in 1997—year of his premature death— as foundation and bears in mind the experience matured in the 90’s at his ‘non-museum’, the MOMAS in Greece. “If I am not given me the possibility of an exhibition in a museum, I will establish my own museum, far away, on the outskirts of the art world. I will invite my friends and colleagues and send invitations. These invitation cards will be the only concrete proof”, stated the artist who, in a rundown building set near the sea, founded his museum: the MOMAS. As founder, curator and director of MOMAS he prints and sends invitations, organises yearly events and exhibitions with numerous friends, artists and colleagues, including: Lukas Baumewerd, Cosima von Bonin, Hubert Kiecol, Michel Majerus, Stephen Prina, Elfie Semotan, Ulrich Strothjohann, Christopher Williams, Johannes Wohnseifer, Christopher Wool, Michel Würthle, and Heimo Zobernig. Kippenberger investigates on the difficult relationship between the artist and the museum institution, in order to question the role and function of the museum itself. By overthrowing the structure of the museum, with an unpredictable and versatile approach, the artist dictates his own MOMAS conditions, setting an alternative to art’s system of production and reception. The exhibition’s intent is to re-enact the experiences of those years and to shed light on one of the artist’s most ambitious project, offering the viewer the opportunity to see works, photographs, documents rarely exhibited, coming from the collections of MAMCO, Geneva, the Estate Martin Kippenberger, private collections in Greece, and the archives and collections of the artists exhibited. A new edition of the catalogue MOMAS Martin Kippenberger: Museum of Modern Art Syros has been published for the occasion, along with a poster created ad hoc by artist Heimo Zobernig. The show, which will be hosted at Palazzo Sant’Elia in Palermo, is organised by Istituto Svizzero on occasion of its 70-year anniversary, in collaboration with MAMCO, Geneva and Estate of Martin Kippenberger, Galerie Gisela Capitain, Cologne. Next spring the exhibition will tour to MAMCO, Geneva, where it will be on view from the 30th May to 9th September 2019.